Happy World Card Making Day again! I will be continuing the card making posts throughout the day, so make sure to check back for more fun! This card was inspired by the Tuesday Trigger over at Moxie Fab World. This was so easily my favorite photo that Cath has ever put up for the Tuesday Trigger! I love evvvveryyyything about it: the colors, the banner, the patterns, the buttons, and especially that fantastic bird. That was my main draw! The card didn't turn out exactly like I imagined, but I think if I gave the concept another shot it would be amazing. I have the little girl birdie flirting/teasing the boy birdie, and of course men are fools so now he's in love :) I used all the things I mentioned above for inspiration! Very cute take on the challenge! 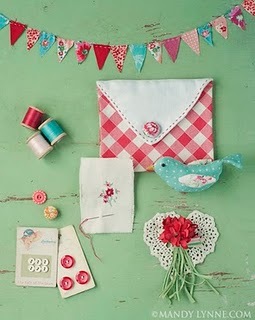 Love the little birds and the banner. I haven't attempted it yet - maybe today. Aw.. ..your card is DARLING and SWEET! Perfect take of the TT! And what can be sweeter than your message to your hubby!? Thanks so much for sharing your happiness with us!